Ok, this starting to get a bit out of hand. 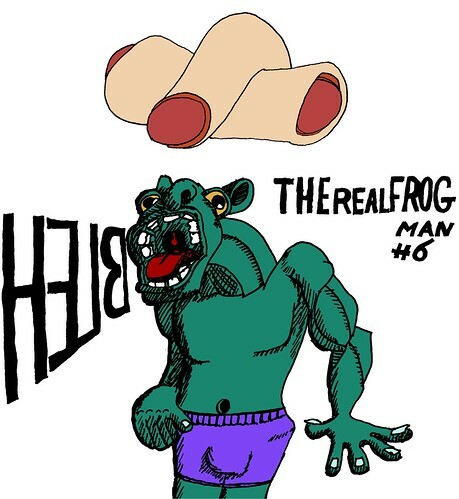 THErealFROGMAN is even realer than earlier. That may seem an ideal to aspire to some, but for me, who wants to draw comics, it isn’t. I’m learning a lot about line width and crosshatching. It is powerful stuff I haven’t even scratched the surface of. It also reminds me of engraving, where you use lines to indicate shading and vary your color values in colored prints. Now I come to think of it, many of the techniques I see in black-and-white print comics bear resemblance with woodblock printing, or linoleum block printing. Comics have come from book illustration in a time before offset printing. The advantage of such crude techniques is that the artist needed to simplify his artwork, which coincidentally also strengthens the readability, and –if the artist has done his homework– the communicative value of the artwork. Making the art more stylized makes the art less specific and gives the viewer more room for interpretation. It is too bad that in modern comics the art has become so realistic. It is as if being picked up by the movie studios is more important than inspiring your readers. Ah well, who pays most gets most. Comic books are sold for less money than what they are worth. On the other hand, relying on a dying industry (read: Hollywood and the MPAA) isn’t a good thing on the long term for mainstream comic book companies. If they continue on their chosen path, they will go the way of the Dodo as well. So, making it less real, and more stylized will improve the drawing, in the sense that it will appeal more to the viewer, and lend itself better to be included in a comic strip. Of course, that is also so much harder to do. Perhaps I should pick up my linoleum block printing tools from long ago, to force myself to draw in a certain, more stylized way.